My mom and I went to a family get-together at my uncle and aunt's house this year for the Fourth of July. I enjoy spending time with my dad's side of the family, but it doesn't happen very often. They are a lively group with lots of laughing and good stories. All in all, it was a nice way to spend the holiday. 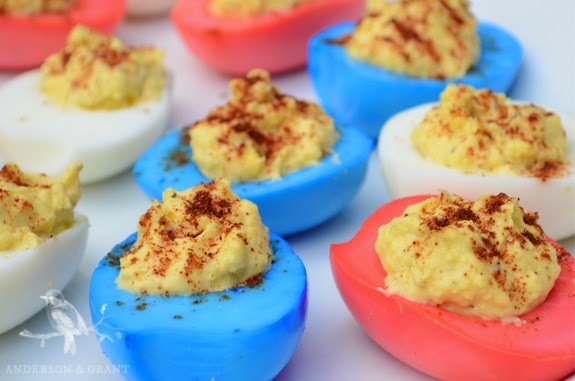 One of the dishes we took to the party was filled with some festive Deviled Eggs dyed in patriotic red, white, and blue shades. I've said before that I like taking that extra little step to make things special and memorable.....even if it is purely for my enjoyment. 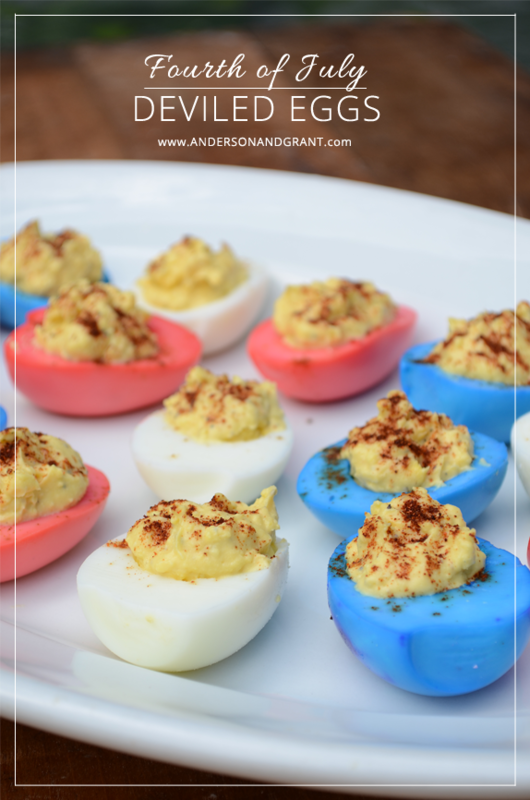 Rather than make the normal white deviled eggs that are commonly seen at summer picnics, I decided to color the eggs to stick with the theme of the day. Don't they look fun and festive? 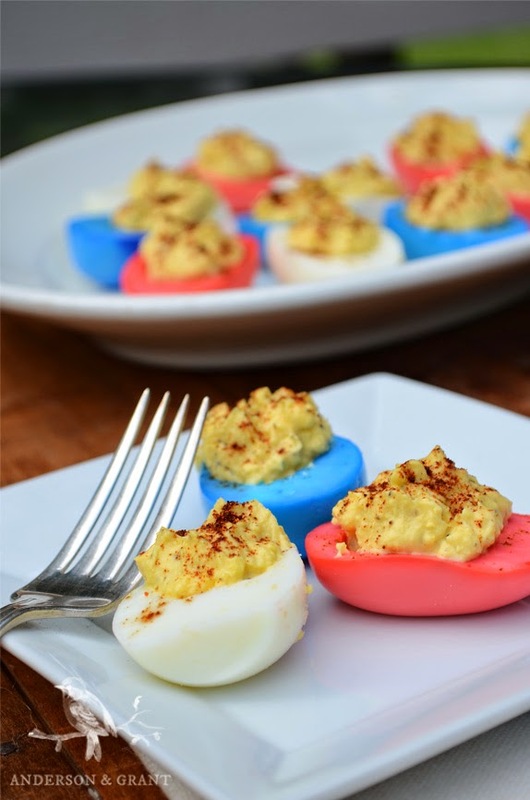 CAN DEVILED EGGS BE DYED FOR ANY OTHER HOLIDAY PARTY? While you might be saying, "This is something I'll have to remember for next year," I think that dying deviled eggs is an idea that has so many possibilities outside of the Fourth of July. A tray full of red, yellow, and orange deviled eggs would be beautiful for a fall party, while pastel colors are perfect for an Easter buffet. Or coordinate them with the colors of your wedding for a bridal shower. This is really an idea that you can use year round. 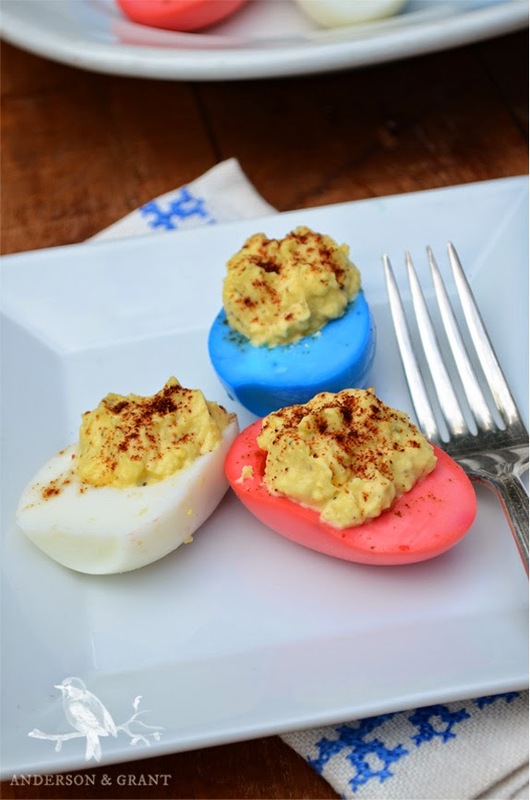 HOW CAN YOU DYE DEVILED EGGS? The eggs are dyed after they have been hard boiled, the shells removed, and cut in half. You'll need a separate mug or glass filled two thirds of the way with water for each color you want to make. Add 1 teaspoon of cider vinegar and your food coloring to the water. I used paste food coloring because it is what I had on hand, but you can also use the liquid form. Unless your deviled eggs have an out of this world taste, no one will probably remember them by the time the next party comes around. But who can forget eggs that were dyed red, white, and blue?!?! You are welcome to use your own recipe for the deviled egg filling, but here is the recipe my mom uses just in case you need it. It can be doubled or tripled depending on how many eggs you'd like to end up with. Hard boil six eggs. After they have cooled, peel the shells off and cut the eggs in half. 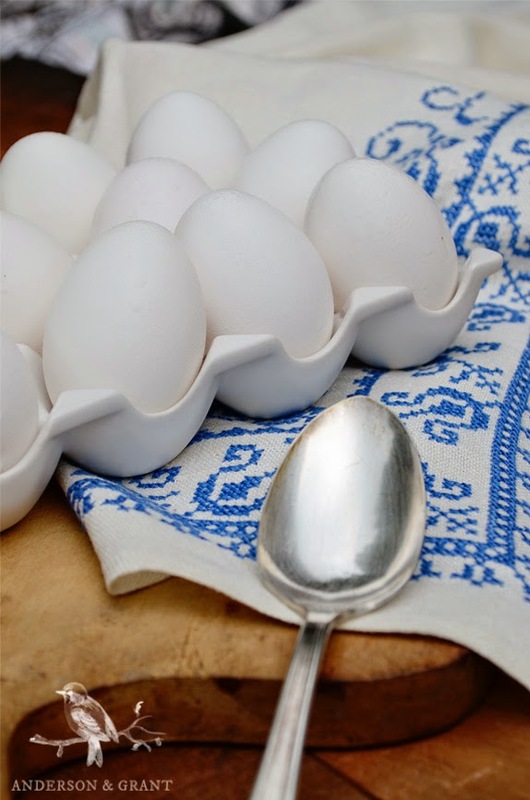 Scoop out the yolks into a bowl and mix in salt, pepper, mustard, and mayonnaise. You may want to add more mayonnaise if the mixture doesn't seem moist enough. Refill the egg whites with the mixture. Sprinkle on a little paprika over the tops if you'd like.